Jasmine has raised £430 so far and hopes to sponsor the room her parents stayed in at Crawford House for the rest of the year. By the time I was six months old, I’d had 11 operations. I was born prematurely with a birth defect called gastroschisis, in which my intestines were on the outside of my body. I needed immediate surgery at less than an hour old. It was while I was recovering on the intensive care unit at Newcastle’s Royal Victoria Infirmary (RVI) that my parents were told about Crawford House, a place that kept my family together in our time of need. Being so critically ill at just hours old was incredibly scary for my parents, Nicola and Robert. We’re from South Shields and although some may think it’s just a short distance to Newcastle, when you’re told your child might not survive travelling is not an option. It’s too risky. 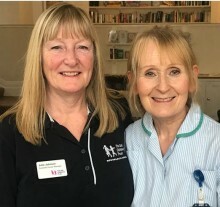 I spent six months in RVI – my health shifted between critically ill and stable, and when it was touch and go my parents stayed at Crawford House. On the days when I seemed better, they offered their room back to the charity and made the journey home. But either way Crawford House was always there for them, welcoming them back with open arms. Growing up, I always knew about Crawford House and my parents’ gratitude – but I didn’t know that it was part of The Sick Children’s Trust until last year. I didn’t know that there were nine other ‘Homes from Home’ around the country, supporting families just like mine since 1982. Even though I was just a newborn when my parents stayed at Crawford House, and I don’t have any memories of that time, I know how much it meant for them to be close to me and how lucky I am. Crawford House gave them the security of knowing that even if they were just freshening up or making food, if they received a call to their room, they would be by my side within minutes. In a completely abnormal situation, Crawford House allowed some normality to be restored to their lives. If it wasn’t for The Sick Children’s Trust they would’ve had to find somewhere to stay for six months or travel between South Shields and Newcastle every single day which would’ve been extremely hard in those circumstances. When you have a seriously ill child in hospital travelling even 30 minutes a day makes simple daily activities very difficult. The Sick Children’s Trust is an amazing charity that has helped so many families who have sick children in hospital and I truly believe that if it wasn’t for the charity I wouldn’t be who I am today. I believe that the most important thing for a child in hospital is to have their parents and loved ones close by. This wouldn’t have been possible for my family, and thousands of others, if it wasn’t for The Sick Children’s Trust. 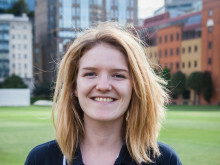 Since finding out about The Sick Children’s Trust and its work across the UK, I’ve been doing all I can for the charity – even though I’m currently studying abroad in Australia. Last year I planned to do the Great North Run which I couldn’t do in the end, so I found a half marathon in Melbourne. I can say that I successfully completed my first half marathon, on the other side of the world all by myself! I’ve managed to raise enough money to sponsor the very room that my parents stayed in when I was born, and when I went home for Christmas break I got to see first-hand the incredible work carried out at Crawford House. It was the first time I’d been there in 20 years. Handing over the cheque to the House Manager was the most rewarding experience. It felt amazing to be able to give back to the charity to say thank you for everything. The Sick Children’s Trust helped my family in so many ways, it was so much more than just a place to stay. It is because of this that I will continue to raise money and awareness for this charity, so that other families receive the same support that we did. Jasmine Casey, 20 years old. Crawford Assistant House Manager, Emily, was supported at Crawford House five years ago when her son, Daniel, was born at just 25 weeks. 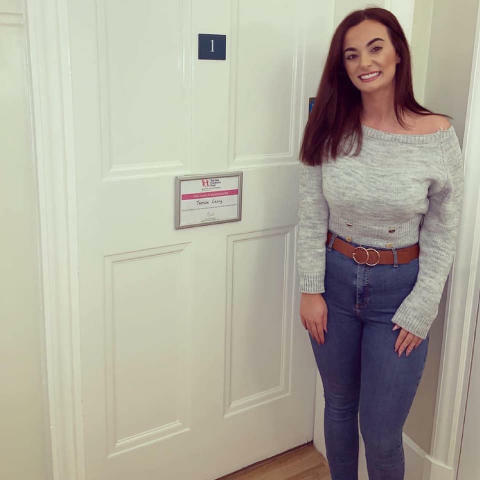 Since then, Emily has become a support to many of the families who pass through the door at Crawford House. Here she shares her experience. Nothing can prepare you for having such a tiny baby, but Crawford House has meant I’ve been with Ella-Rose every step of the way. 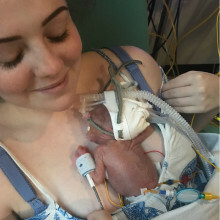 Ella-Rose weighed just over one pound when she was born on 31 July just 26 weeks into Sophie's pregnancy. Miraculously and against all odds she survived and made it home on her due date, which was 5 November. We supported Mum, Sophie, in Crawford House whilst Ella-Rose grew stronger in Royal Victoria Infirmary.